*Note: You should only consider a distributorship if you have some way to sell them. To collect bonuses and commission at the second level (gold) you have to purchase $1500 of product from the same distributor you purchase your kit from. Share the wonderful healing benefits you are receiving using your biomat with your family, friends and co-workers and contacts. Make extra money part-time from your home. Start your own business. All you need to be an Independent Representative (distributor) is to purchase a Distributor Kit. If you haven't yet become a distributor and are planning on purchasing a biomat, why not sign up at the same time as an independent representative for RichWay and make money when your friends buy or sell one? You get paid a commission on every sale you make and from every sale your customers make that also sign up as distributors under you. The bonuses you make on top of the commission are great. The Distributor Kit contains everything you need to start selling the BioMat, the Alkal-Life and the Rejuvena System, as well as distributor kits themselves. 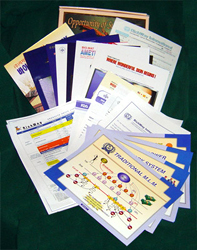 It contains several brochures, order forms, and information materials. Purchasing the Distributor Kit also gives you one Business Center (if you have not ordered a biomat). The income an independent representative is eligible to earn through the Richway sales Compensation Plan increases as their business grows and higher status levels are achieved. Retailing Richway's products of high quality merchandise is the most integral part of building a Distributor's business. Richway's Sales Compensation Plan is highly regarded. The Plan was created by the company founders as a means for the average person to achieve great income through developing and operating a retail sales business. Richway's plan exhibits unsurpassed rewards because Richway is committed to assisting distributors to succeed by energizing their business and motivating their organization through a variety of incentive campaigns. Anyone who completes an independent representative application & agreement form, purchases a starter pack direct from the company and has their application approved by Richway. Will receive a 5% Sales Commission. Will qualify to be a partner. Will qualify to be a Gold Executive. Will receive a 7% Sales Commission. May be promoted to be a Emerald Executive. May earn one Placement Certificate per week. An independent representative who generates personal business volume of $6,000 after becoming a Gold Executive and meets the requirement. Will receive a 10% Sales Commission. May earn Training Bonus 10% of the Total Amount of Binary paid in the same month to their down line Representatives that have been sponsored. May be promoted to be a Diamond Executive. An independent representative who generates personal business volume of $6,000 after becoming a Emerald Executive and meets the requirement. Will receive a 20% Sales Commission. May be promoted to be the MD and/or Royal Family. May earn on Placement Certificate per week. May receive Diamond Executive Watch. An independent representative who meets the following criteria achieves the pinnacle of success with Richway. Develops extended group and assists 4 independent representatives, whom they sponsored to become Diamond Executives. Receives a combined total of at least $50,000 in quick pay, binary bonus (promotional bonuses included) during the calendar half (6 months) of qualification. May be promoted to be the MD. May earn profit sharing bonus in Company Gross Sales Volume 2% of Total. RichWay offers a diverse selection of fine merchandise at competetive prices. Independent Representatives may earn a substantial Retail Profit selling RichWay products to the Ultimate consumer. In addition, Independent Representatives are eligible to earn weekly Quick Pay, Sales and Training Bonuses. These Bonuses are determined by the number of Sales made within each Leg of a Representative's organization. You earn 1 Business Center for every $500 in product you buy or sell. Each business center has 2 legs, a right and a left. The way this network marketing program works is you add business centers until you have 6 business centers on each leg. Again, you earn business centers for every $500 in product you buy or sell, so when someone else orders thru you, they earn business centers just like you did with your order, but you also earn the same number of business centers they just earned. When you have 6 business centers on each leg you earn a binary bonus of $400. It works like a tree, similar to a family tree. Each business center is its own tree with a right leg and a left leg. An example of the layout of Business Centers is shown in the Teamwork System picture. At Diamond Executive Status - When a diamond Executive Generates 6 - 11 Sales in each Leg of one of their Sales increments, they earn a $400 Binary Bonus. When they generate 12 -17 Business centers in each Leg of one of their Sales increments, they earn an $800 Binary Bonus. When they generate 18 or more Business centers in each Leg of one of their Sales increments, they earn a $1,200 Binary Bonus. The Royal Family Bonus Pool - Share in Company Gross Sales Volume (2% of Total). - The Royal Family bonus Pool is calculated by taking 2% of the Company's total Business Volume for 1 year. This amount is then divided by the total number of Royal Family Members according to their sales volume. Each time a Representative with a status of Gold Executive or higher earns a Sales Bonus, they receive a Placement Certificate which entitles them to a free Business center. A Representative may earn a Binary Bonus on these free Business centers. The Placement Certificates and free Business centers are for the purpose of placement only, and do not entitle the Representative to any Company products, do not count as a Sale, and are non-transferable. A Representative may earn up to one Placement Certificate per week.